Hello. I’m an artist, musician, educator, and more, technologist, developer, designer, researcher, producer, and curator, based in Manchester, UK. I like to think my work comprises entertainment, accessibility, and whimsy. I like to make physical and digital things, for both fun and functionality. Just recently, I built an arcade. In the past I've made sculptures that respond to humans, built tools and toys for my home, and transferred electronic circuits to canvas. Oh! I'm also a composer and performer. 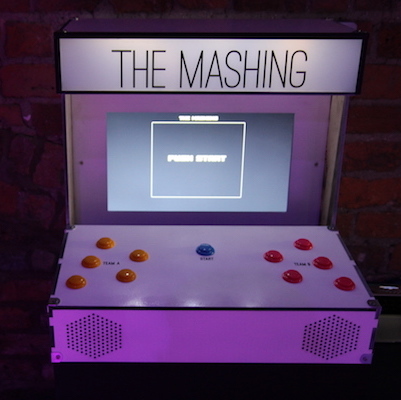 The Awkward Arcade is a real life experimental video arcade, showcasing games that make you move and think in ways uncommon in mainstream games culture. Physical Echoes is an interactive installation that explores the transitory nature of sound by creating a real-time, physical output. 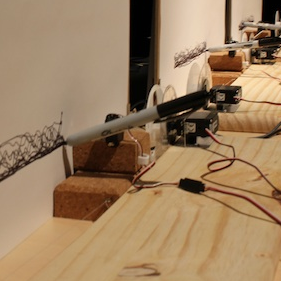 The piece generates pen drawings, offering an abstract snapshot of sound within a space. The latest iteration of the work was shown at the National Media Museum in March 2016. 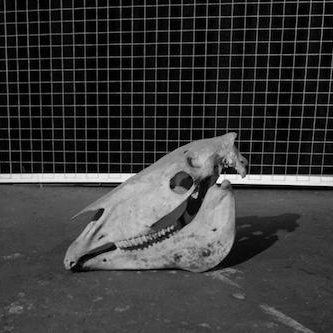 I created the original version of the piece during the final semester of my MA, and first exhibited it in the University of Salford's Digital Performance Laboratory (DPL) in January 2013, and at the Ionian University's Audiovisual Arts Festival, 2013. The Mask Mirror is a handmade electronics, software, and craft project, made in one afternoon early in 2012. 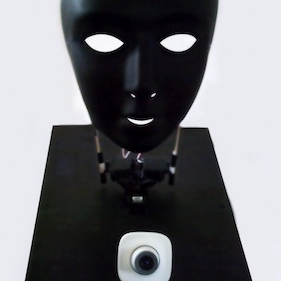 It tracks a person's head movements and reflects them in the movement of a mask. The mask was originally exhibited at the University of Salford's MediaCityUK Campus in Spring 2012 and was shown again at the Museum of Science and Industry as part of the Manchester Mini Maker Faire 2012. My home is littered with various whimsical creations, adding a touch of practicality or playfulness to my life. 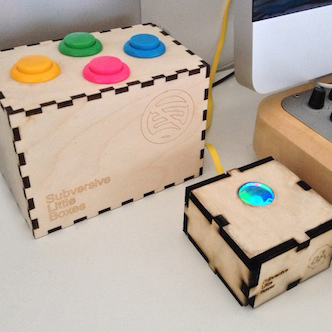 My 'Subversive Little Boxes' were physical peripherals for online life: one acted as a remote and advert-silencing tool for Spotify, another as an early warning system for spoilers found on web pages. 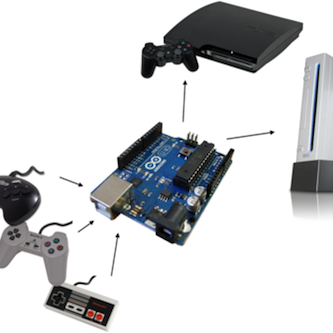 I've also made an Arduino-powered bridge for connecting classic games controllers to modern consoles, a tweeting letterbox, and a kettle that's aware of my location. 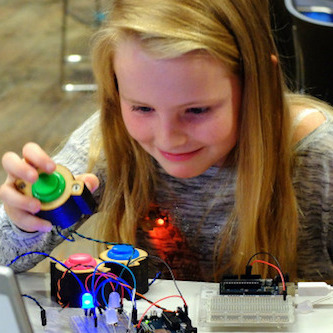 I've been teaching creative technology workshops for around 7 years, patiently showing 6-year-olds and 60-year-olds alike how to make cool stuff with electronics, code, light, and sound. 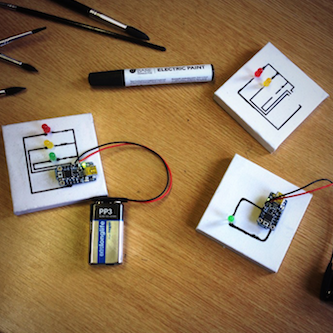 Pictured above are a canvas electronics workshop – utilising conductive paint to make wall-hangable circuits – and an 'Awkward Arduino' workshop – demonstrating the technology principles that go into my Awkward Arcade. I've run workshops for local authorities, including Manchester City Council and Blackburn & Darwen Borough Council, as well as smaller organisations such as Manchester Digital Laboratory and AfroFutures_UK. Please contact me if you're interested. I’ve been a musician since the age of 9, and have been composing since I was 12. Everything I’ve done in my career so far stems from the time I spent in recording studios between the ages of 14 and 21. Above is a still from Howard Walmsley’s Savages (2014), for which I composed, performed, and recorded a solo piano score. 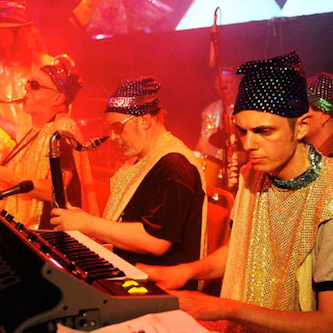 Also pictured are the the Part Time Heliocentric Cosmo Drama After School Club – a 12-piece Sun Ra tribute lead by Paddy Steer and Graham Massey – originally formed for a one-off Sun Ra tribute evening at the Kazimier, Liverpool. Since then, we have performed at various alternative music evenings in the North West, and played two sets for the BBC's first 6 Music Festival. A documentary made about the band – exploring Ra's legacy, and why 13 musicians based in Manchester came together to pay tribute to his music – was shown at HOME, Manchester in March 2017, and is also available online. This is just a taster of what I do. Heard about something else I do that isn't listed here? Curious what else I'm capable of? Get in touch if you want to know more.